Sigma Chi’s Mark V. Anderson Character-in-Action Leadership Award is presented to brothers who go out of their way to help others, promote citizenship and lead with integrity. Delta Delta’s Don Trieschmann ’58 was recently selected as the recipient of this prestigious award. Don Trieschmann ’58 (right) organizes building projects that benefit those in need who need their residences repaired. For the past 12 years Don has used his carpentry skills to help homeowners in need through Rebuilding Together North Suburban Chicago (RTNSC). This program provides free home repairs and home improvements for the elderly, individuals who are disabled, veterans, and families with children. As a house captain and a member of RTNSC’s board of directors, Don evaluates homes, assesses the costs to make repairs, and then assigns and manages volunteer groups who carry out the work. 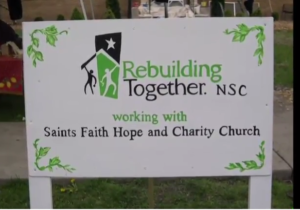 Don is also active in fund raising and has quadrupled the local RTNSC chapter’s capacity to serve, according to Sharon Riley, RTNSC Executive Director. Many of the homes that RTNSC repairs are often in poor shape. Rehabbing these homes helps the occupants live safe and happy lives which for Don is the most rewarding aspect of the work they do. For the second time the Character-in-Action Award has been given to a member of Delta Delta. In 2015 Ben Waters ‘16, Jake Clark ‘16, Cameron Sanders ’16, and Bryan Hall ’16, received this award for Serving Others Through the Xavier Project. This makes Delta Delta just one of two chapters that have been recognized twice. The other is the Zeta Psi chapter at the University of Cincinnati. To learn even more about Don’s efforts we’d encourage you to check out the video that Bernie Sergesketter has produced. Go to Trieschmann Gives Back. Portions of this article were excerpted from “Building an Impact” by Angeleen Kipfer, The Magazine of Sigma Chi, Spring 2018.